I have an addiction to the outdoors, so say my niece and nephew. In my humble opinion, they have an addiction to video games. There’s no better place for our obsessions to merge than at New Mexico’s Kasha-Katuwe Tent Rocks National Monument, a surreal 4,645-acre playground of volcanic geology that can still blow the mind of two occasionally sardonic teenagers who think they’ve seen it all — if only on a video screen. “Excuse me, excuse me … excuuuuuse me,” my nephew Devon pleads as he darts past a young couple on a selfie binge. 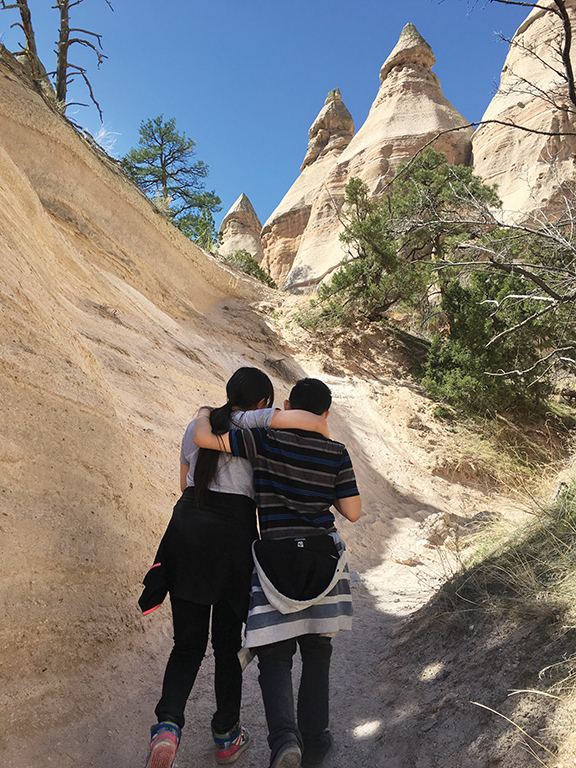 The amorous teens stop every few seconds to pose against the conical hoodoos as the dusty trail begins the slow 600-foot climb. Hikers jam in the narrow canyon, but I can appreciate the kids’ desire to capture this wild landscape on camera. I’m also amused to see how Devon, a slender natural athlete who lives more in his head than in his body, is charging ahead, his cool 13-year-old façade unhinged by the joy of moving. 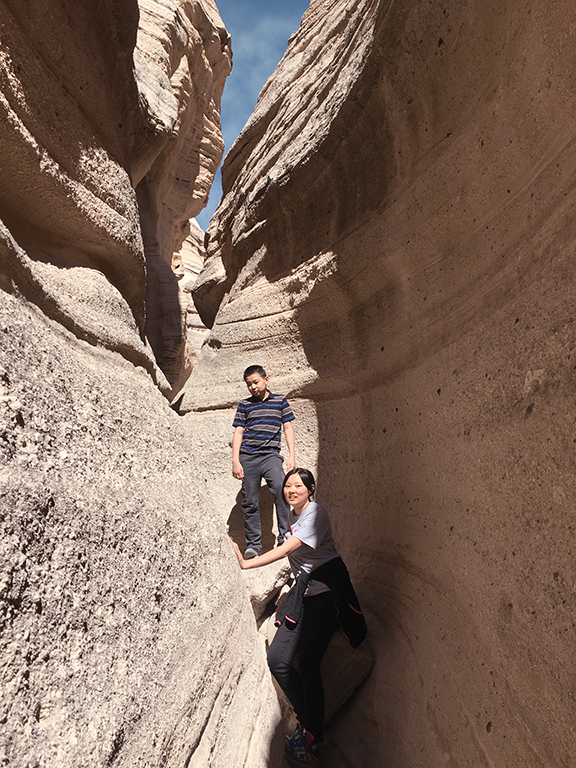 Sieanna and Devon explore the pink-and-beige canyons and formations of Kasha-Katuwe Tent Rocks National Monument in northern New Mexico. Photo by Stephanie Pearson. 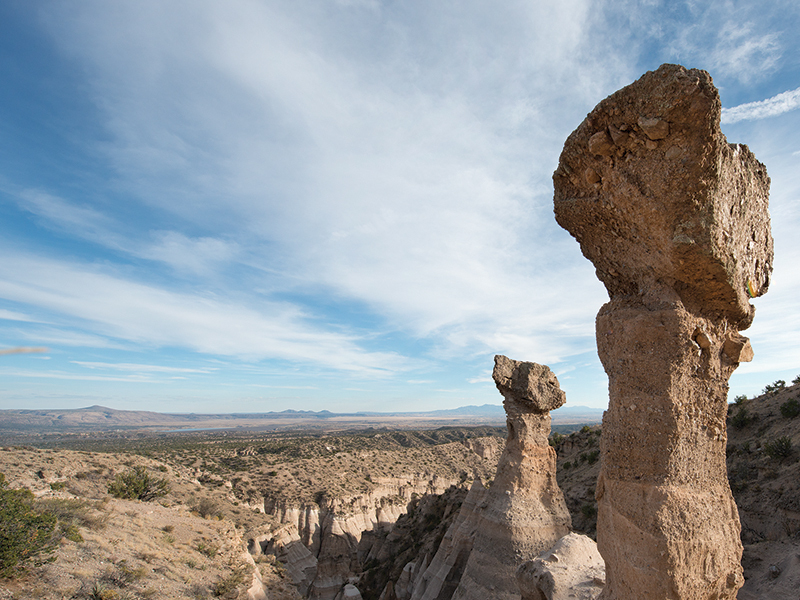 Sitting at 5,570 feet on the Pajarito Plateau between Santa Fe and Albuquerque, Kasha-Katuwe Tent Rocks is otherworldly. Pink-and-beige ash spires rise 90 feet high, deposited between 6 and 7 million years ago by a cataclysmic eruption in what are now the Jemez Mountains. Over centuries, wind and water have shaped the spires into cylindrical cones, some of which are topped by boulders that look as if one poke could cause them to topple over and wreak havoc in the canyon maze below, like an oversized, out-of-control pinball. Hike the steep trail to 6,760 feet and the Rio Grande Valley unfolds in a 360-degree panorama. If this were a normal weekend day, humans would be scarce, but this is a bluebird spring break Sunday, and the trail is packed with families who had the same idea I did. “Hurry up!” Devon commands to his 17-year-old sister, Sieanna, as he grabs her by the hand. The two siblings love to bicker, but they are also fiercely protective of each other. Having spent most of their lives in the most dense urban blocks of Minneapolis and Houston, they haven’t had an opportunity to experience the outdoors beyond a city park, which is why I urged their dad to let them spend spring break in New Mexico. Sieanna, a smart introvert who doesn’t care much for physical activity, especially treads with caution and stops to catch her breath for 20 minutes under the vanilla-scented shade of a towering ponderosa pine growing along the narrow path. It has a network of roots so large and exposed that we can walk through them. My natural tendency when hiking is to charge ahead, and I have to check my impulse to hurry the kids along as they stop to explore every cactus and divergent crack of the 3-foot-wide passageway that winds through 30-foot-high canyon walls the texture of sandpaper. 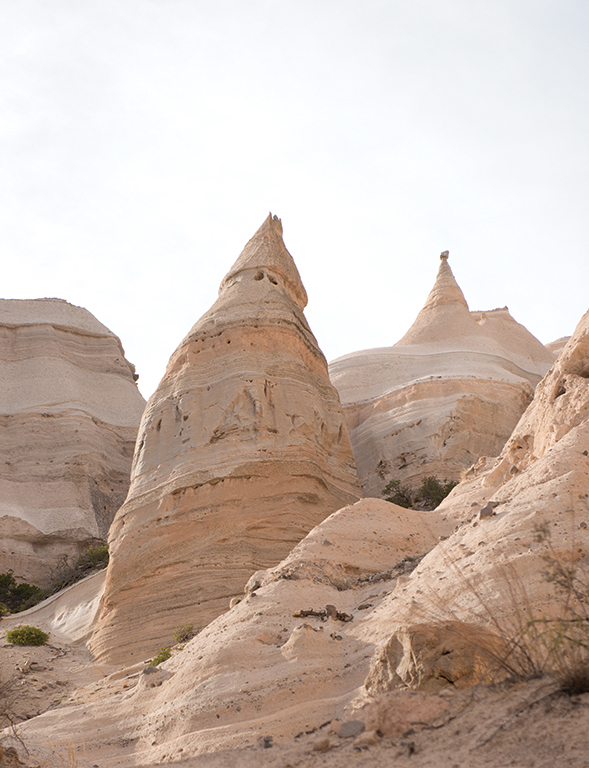 At Kasha-Katuwe Tent Rocks, centuries of wind and water have shaped 90-foot-tall ash spires into cylindrical cones — some of which are precariously topped by boulders. Photo by Douglas Merriam. As anyone who has spent time in New Mexico knows, the space in this state can be overwhelming, from the peaks of the Sangre de Cristo mountain range to the piñon and juniper forests of the Gila wilderness to the caves of Carlsbad Caverns National Park. That’s why Kasha-Katuwe is an ideal starter expedition: Here there are only two trails, the longest of which is 3.5 miles round trip and ascends 630 feet to the top of the white cliffs — making it not too long, not too high, and almost impossible to get lost. But this isn’t Disneyland either. There are no fences to keep preoccupied teens from a free-fall, there is no drinking water available, and rattlesnakes and coyotes live here. Sieanna, Devon and I are about eight centuries removed from the first known visitors to Kasha-Katuwe. Cochiti Pueblo, one of the eight northern New Mexico pueblos, is adjacent to the monument. 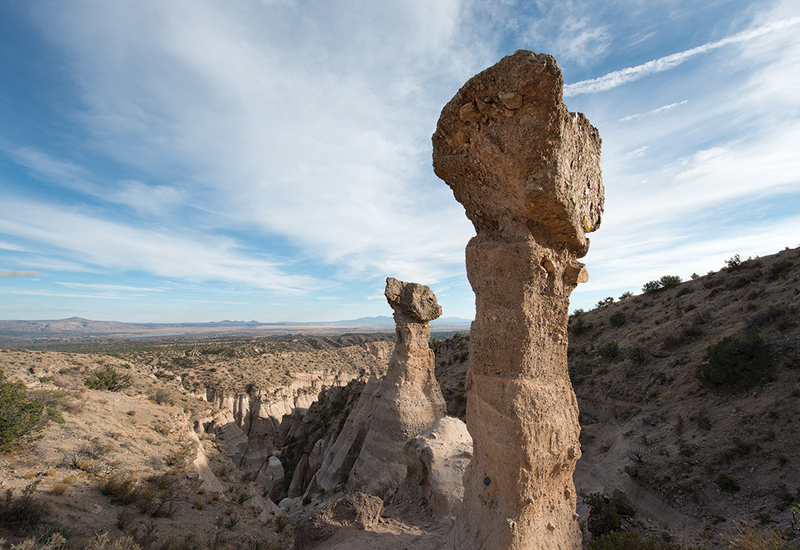 To access the park from Interstate 25, one has to drive 5 miles through Cochiti land. Cochiti’s ancestors have been in this valley since the 14th century. The name, Kasha-Katuwe, means “white cliffs” in the Pueblos’ traditional Keresan language. I feel it’s a privilege for us to be here, and I want Sieanna and Devon to understand, that like so many places in New Mexico, this ground is sacred. Fortunately, the view from the top conveys that message better than I can. There are only two trails at Kasha-Katuwe, the longest of which is 3.5 miles round trip and ascends 630 feet to the top of the white, sculptural cliffs. Photo by Stephanie Pearson. “What beauty!” Devon exclaims, drenched in sweat. His sister, trying to catch her breath, is less demonstrative but equally exhilarated by the expanse and beaming with her accomplishment. To the southeast is the unmistakable hulk of Albuquerque’s Sandia Peak. To the northeast, the still-white spine of the southern Sangre de Cristo mountains rises toward the sky. To the west, charred tree skeletons serve as a reminder that natural forces are always in play. In 2011, the Las Conchas fire burned more than 150,000 acres. The apocalyptic plumes of smoke threatened to engulf Cochiti Pueblo. Between the geology, history and forces of nature, there are plenty of facts I could pass on to the kids, but I can’t remember any of them, which makes me feel like a bit of a failure as their guide. Then again, nothing I can say matches the power of the view. As we hike down the trail I slow my pace for once, letting the kids lead the way, grateful that this magical cluster of rocks can crack the hard shell of a teenage soul.